The crush to jump on the Nelson Mandela bandwagon in Ireland and elsewhere is truly remarkable. Every two-bit political leader from Belfast to the Balkans is proclaiming their love for the great man in deeply emotional terms. It was not always so. In Ireland for instance, the three main political parties, Fianna Fail, Fine Gael and Labour refused to support the Dunnes Stores strikers in the 1980s when they refused to handle South African produce. Only Sinn Fein, the Communist Party and various other left wing groups came out and picketed for the women, who lost their jobs at the giant retailer when they refused to handle South African produce as per their union’s instructions. 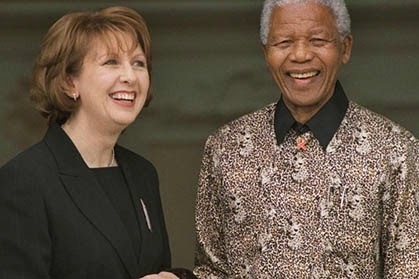 Now the women are on their way to Mandela’s funeral and the main political parties in Ireland are acting as if Mandela was always their hero and South African apartheid their sworn enemy for ever. Likewise in Northern Ireland. When John Hume was put forward for the Freedom of Derry it was noted that Nelson Mandela had been put forward for the same award in 1986, but only Sinn Fein voted for it. The SDLP and Ulster Unionist parties all voted against it. In Britain, the Federation of Conservative Students – attached to the ruling party – circulated “Hang Mandela” posters in the 1980s. Margaret Thatcher and Ronald Reagan attempted “constructive engagement” policies with the white government in Pretoria. Current UK PM David Cameron went on a fact-finding mission at the invite of South Africa's all white government. All of which goes to show that politics make strange bedfellows when expediency intervenes. Among the hundreds of dignitaries who will attend Mandela’s funeral will be many who regarded him as a terrorist not so long ago. Mandela will not be the first or last to be considered a freedom fighter conveniently by leaders who thought otherwise a few years ago.